Holiday Special $8.00 per Loaf on All Orders!!! One bite of Nana’s Banana Bread and you’re hooked. Simple, yet delicious, Nana’s Banana Bread will blow away even the most discriminating palate with our first class ingredients and capricious flavor. Made only with fresh and natural ingredients and no preservatives, Nana’s Banana Bread is made with or without nuts or raisins and can be shipped right to your home! Indulge yourself in an aromatic breakfast, snack, or add a finishing touch to a homemade meal. Available in one pound and three pound versions, these delicate loaves compliment any occasion. 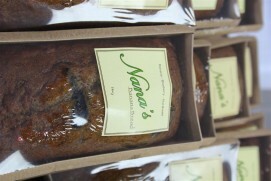 Santa Clarita is now home to Nana’s Baked Goods, “Home of Nana’s Banana Bread”. We are located on Arch Street in Newhall, California, where you’ll taste the best baked goods and banana bread in SCV. That’s not all; also enjoy our delicious soups, sandwiches, empanadas, and always something special. Oh, and by the way our coffee is amazing. 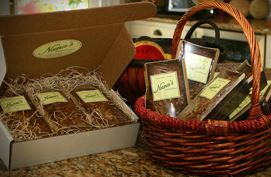 We can deliver our banana breads locally, or package and ship them anywhere you desire. Order now! Give the gift that keeps on giving with Nana’s gift baskets and bread boxes – perfect for friends, family, clients, neighbors, any occasion and all ages. They can be filled with cookies, cone pops, fudge, or sweets of your choice. 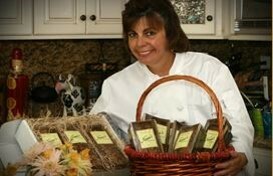 See our line of homemade recipes on our menu. You can find us in the beautiful, historic district of Old Town Newhall, California, off of 13th street and Railroad Avenue, but come visit Nana’s anytime with our virtual tour! Go behind the counter at Nana’s with Gloria and Francisco as they share the history of the bakery and reveal some of the magic behind their banana breads and other tasty treats. Thanks to Bonnie Keith and VideoMagic Productions for making this video! Be the first to hear about the latest discounts, coupons, specials, and more!